MODULE 3. Atong Ampingan, Let’s Take Care of Our Ocean! Did you know that coral reefs have often been referred to as the “rainforests of the ocean”? They are very important to mankind for many reasons. They provide shelter and food for marine organisms, which in turn feed millions of people around the world. Coastal communities depend on them for their survival. Coral reefs also protect these communities from strong currents and high waves. The Philippine marine ecosystem is quite special. 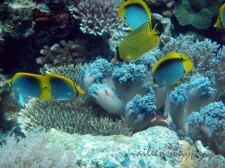 According to renowned scientists, the Philippines is the epicenter of marine biodiversity in the world. It has at least 3 to 5 times more species of fish, corals, and many other groups of organisms than those found in the Caribbean, Tahiti or Hawai’i. Only the most northern part of the Great Barrier Reefs in Australia has more reef species than the Philippines. The Philippine coral reefs have been described as a breathtaking explosion of colors and vitality. To Filipino fishermen and their families, this is part of their home and their means of survival. To divers and snorkelers, it is an awe-inspiring and moving experience. Slide the magnifying glass over the highlighted islands and click on them to learn more.